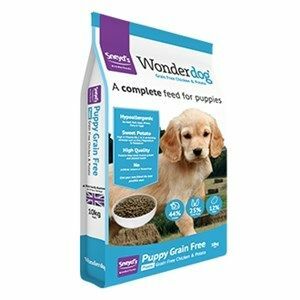 Sneyds Wonderdog Grain Free Chicken Puppy Food is free from common ingredients that usually result in allergic reactions when a sensitive dog eats them. That means there is no beef, pork, soya, wheat dairy or eggs in this food to aid digestive health and overall wellbeing. There are also no artificial colours or flavours.